NASA’s Voyager Mission is the longest continuously operating space mission. It consists of two twin spacecraft named Voyager 1 and Voyager 2. Both the spacecrafts are identical in construction. This mission was developed in the early 1970’s with the purpose of making a grand tour of Jupiter and Saturn. There were plans to include Uranus and Neptune as well if everything would work according to the plan. 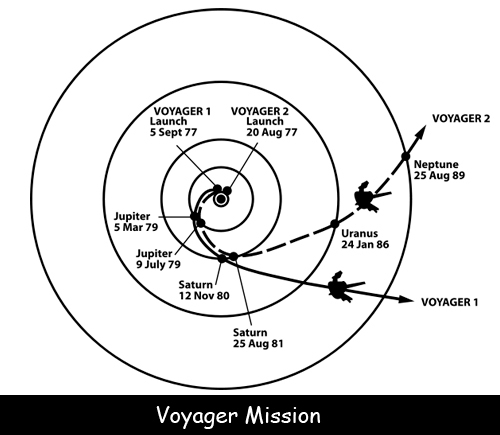 Voyager 1 was launched on September 5th 1977 and Voyager 2 was launched 16 days before this on August 20th 1977. At a distance of 20.8 billion kilometers, Voyager 1 is the farthest human made object in space. Voyager 2 is at a distance of 14.2 billion kilometers. These spacecrafts have explored all the giant planets of our outer solar system. Voyager became the first ever spacecraft to travel beyond the limits of interstellar space in 2012. This space probe travels at a speed of over 38,000 miles per hour which makes it the fastest moving man-made object in outer space. For more than 40 years now the spacecraft have traveled through space and this makes it the oldest piece of space technology. Each of the two twin probes of Voyager mission weighs around 722 kilograms. These spacecrafts carry a greeting in a phonograph record for any possible life form on any other planet that could possibly encounter it in the future. Voyager 1 has also recorded images of a volcano called Pele. This volcano is located on a moon of Saturn. Declan, Tobin. " All Facts about Voyager Mission for Kid ." Easy Science for Kids, Apr 2019. Web. 21 Apr 2019. < https://easyscienceforkids.com/voyager-mission/ >.